In recognition of the Rolling Rivers Restoration Project, Sierra Soil & Water Conservation District (SSWCD) was recognized as the 2017 Shining District by New Mexico Association of Conservation Districts. 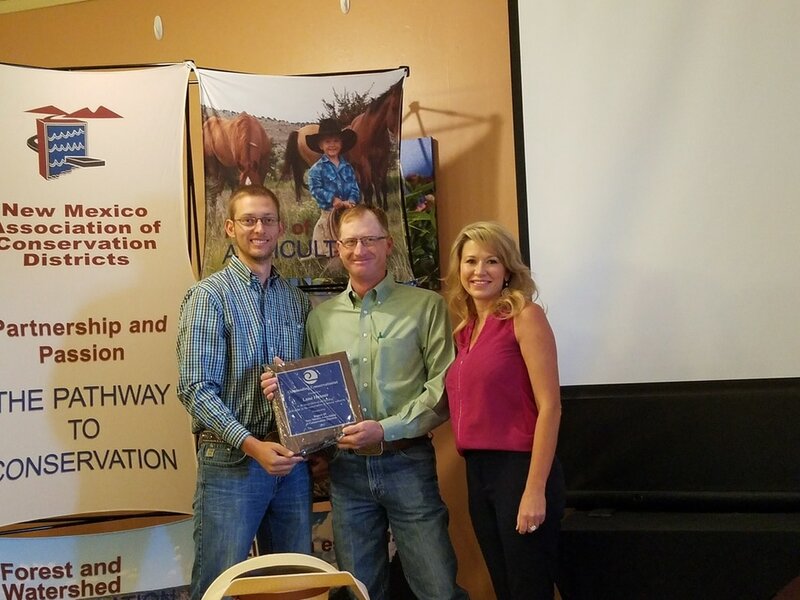 Travis Day and Crystal Diamond award Lane Hauser as Conservationist of the Year during the annual NMACD regional meeting in Elephant Butte, NM. Lane Hauser, BLM Rangeland Management Specialist named 2017 Conservationist of the Year by New Mexico Association of Conservation Districts. In recognition of his diligent efforts & unmatched performance in making conservation a priority throughout Southern New Mexico, we are honored the Sierra SWCD 2017 Conservationist of the Year has gone on to be awarded as the NMACD regional conservationist. For 18 years, the BLM Las Cruces Field Office Range Improvement Specialist has assisted landowners and producers within 6 southwestern counties to install conservation practices that directly benefit the lands. Lane works cooperatively with Natural Resource Conservation Service (NRCS) and other governmental agencies to provide land owners with the best management plan for their operations. His ability to work well with permittes ensures that the best strategies are being utilized to help both ranchers & the environment. Congratulations to Mr. Lane Hauser, a well deserving recipient of this distinguished award!